Car giant Volkswagen has been fined €1bn (£880m) by German prosecutors over its diesel emissions scandal. The Braunschweig public prosecutor said VW had sold more than 10 million cars between mid-2007 and 2015 that had emissions-test-cheating software installed. The car firm said it did not plan to appeal against the fine. Prosecutors said this meant VW had admitted "its responsibility for the diesel crisis". The fine is one of the highest ever imposed by German authorities against a company, prosecutors said. It follows a US plea agreement last year, when VW agreed to pay a criminal fine of $4.3bn to resolve criminal and civil penalties. The total cost of the scandal has been much higher. VW said last year that its total bill for fixing engines in the US was $30bn. 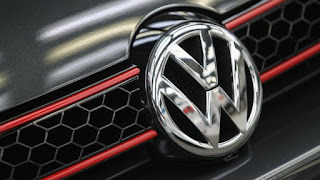 The Volkswagen scandal erupted in September 2015, when the company admitted that nearly 600,000 cars sold in the US were fitted with "defeat devices" designed to circumvent emissions tests.